Welcome to the first GroCapital Gazette for 2017 and a brand new year, albeit the first two months are already behind us, we are back into full swing, with the holidays long forgotten. In this edition we discuss Weather Derivatives which are now brought to you by GroCapital as well as Invoice Discounting. We hope you enjoy reading about these solutions to help your business and make life just a little easier. Can’t wait to have access to eAccounts for your GroCapital facility? Please email: [email protected] or contact your relationship manager at your convenience and we will have the platform installed and your staff trained in no time at all! 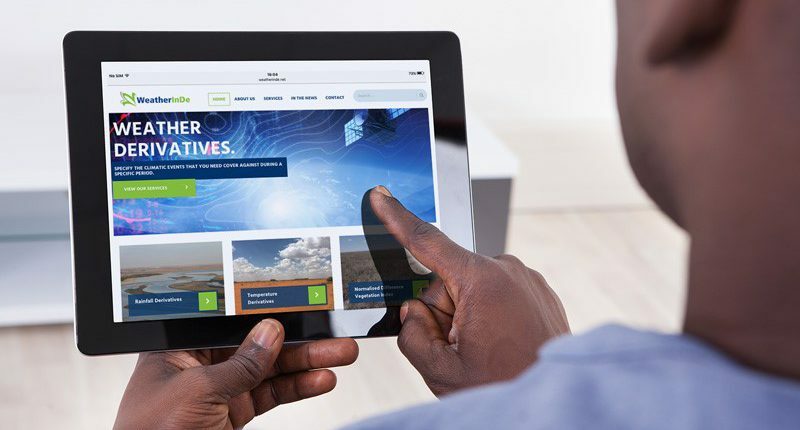 GroCapital, a company in the financial services division of AFGRI, has teamed up with WeatherInDe (FSP45071) to offer clients customised weather derivatives. Weather derivatives are available for any industry sector as a hedge against the risk of changing weather conditions. Changing weather patterns are one of the greatest natural risks faced by many sectors. Testament to this was the drought experienced in 2015/2016. The drought had a tremendously negative impact on not only maize producing farmers, but also on fruit, vegetable and livestock farmers. Record levels of imports bear further testament to the tough growing conditions during this protracted drought. Not only is too much or too little rain a problem, but extremely high and low temperatures can also create a risk for sectors such as wine and citrus production. Weather risk even impacts construction and mining companies as they are at risk of incurring penalties and increasing running expenses during periods of heavy rainfall. Game and livestock farmers are impacted when there are insufficient pastures for their animals during droughts or even floods. Weather derivatives offer a hedge to all these risks. Surprisingly, this is not a new concept. The first weather derivative traded in July 1996 in the USA. Over the counter derivatives were traded until the Chicago Mercantile Exchange (CME) introduced the first exchange-traded weather futures contract in 1999. Weather derivatives under the WeatherInDe brand began trading in South Africa in 2016. Worldwide demand for standardised exchange-traded weather derivatives has slowly been replaced by demand for customised weather derivatives which are rapidly becoming the industry norm. The biggest hurdle in the weather trading industry is finding reliable data sets to use for pricing and pay-outs of these derivatives. In the WeatherInDe product, satellite data is supplied by NASA and used to price the weather derivative and calculate pay-outs. The timespan of a derivative contract can be specified from three days up to one year with the weather derivative customised to suite the client’s individual needs. The derivative needs to be taken out at least 21 days prior to activation and can be bought throughout the year. A weather derivative is similar to a maize, soya or wheat option. A client can choose to hedge against too high or too low temperatures, too much or too little rainfall, or a shortfall of vegetation as measured against the Normalised Difference Vegetation Index (NDVI) during a specific time period stipulated by the client – not shorter than three days but not longer than one year. The data set that is used to calculate a possible pay-out is an average of the rainfall or temperature for a specific 10 by 10 kilometre grid using 25-year historic data supplied by NASA’s satellite data. 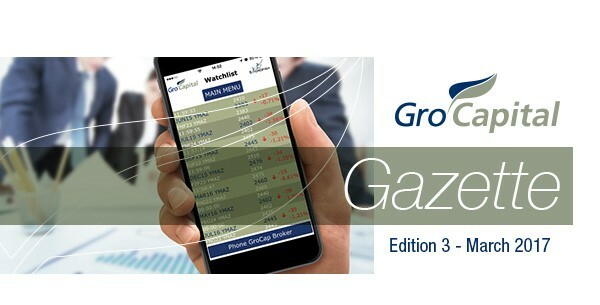 For more information regarding weather derivatives, please call GroCapital Broking on 011 063 2723 or use the GroCapital Trader App. GroCapital has launched an Invoice Discounting Facility to assist corporates to manage their cash flow more effectively. Designed to complement the Working Capital Debtor Financing already offered by GroCapital to unlock value in trade receivables, the Invoice Discounting Facility will help to improve the balance sheet of corporates given the increased volatility in commodity markets. For clients looking to have the cash flow benefit as well as balance-sheet improvement, our Invoice Discounting Facility allows for increased margins on pre-approved debtors. Unlike the Debtor Finance Facility which allows us to advance a fixed percentage of the Debtor book balance, the Invoice Discounting Facility allows GroCapital to purchase the invoices on an outright basis from pre-approved debtors. By doing this, the trade receivables can be de-recognised from the balance sheet, thereby giving real cash flow benefits as well as Return on Net Assets (RONA) improvements. In partnership with Propell Financial Technologies, the entire facility is run on a web-based platform and full support and on-site training is available. 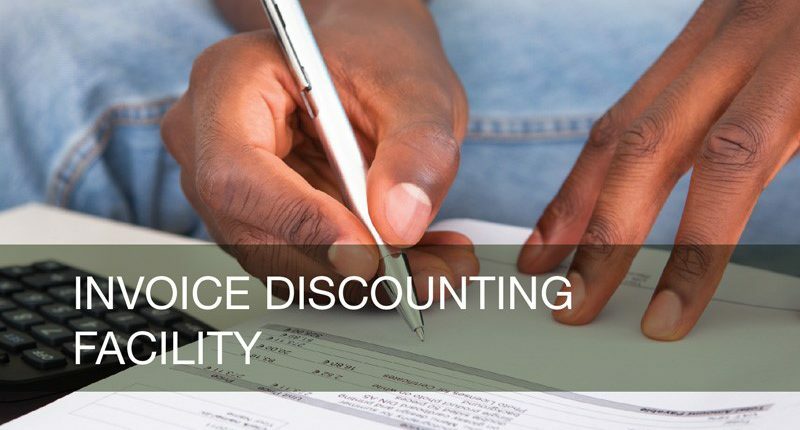 Please contact your relationship manager or Marileen Brits on (011) 063-2591 to find out how you stand to benefit from the new Invoice Discounting Facility. GroCapital is delighted to announce the opening of our partner-run office in Stellenbosch, a move that will ensure our ability to stay even more connected with our clients in the Western Cape.